Although the seasonally adjusted unemployment rate ticked up to 2.7 percent in September from 2.6 percent in August, the increase came as Hawaii's labor force continued to grow and the economy added 7,100 jobs compared with the previous month. 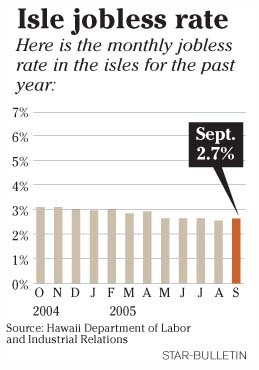 A year earlier, Hawaii's jobless rate was 3.1 percent. Altogether, the state's employed population grew 1 percent during the month to 626,700 from 619,600. Hawaii's 2.7 percent unemployment rate was just more than half the national rate of 5.1 percent. Strong as the numbers were, they were fairly ho-hum in a state that has been in the throes of an economic upswing driven by strong real estate and tourism sectors. "I'm not surprised," said Leroy Laney, a professor of economics and finance with Hawaii Pacific University, and author of an annual economic survey commissioned by First Hawaiian Bank. "I hear all over the place, from all sectors of the economy and all levels of employment ... the story of a labor shortage." A rise in demand for jobs has attracted construction workers from the mainland and apparently led some locals to come off the sidelines to take advantage of what has become a workers' market, where employers are paying premiums to lure good employees. There were 29,150 more people working this September than in the same month last year, a 5 percent increase in the total number of jobs, outstripping the 4 percent growth in the state's labor force. As developers line up to create new projects and tourists continue to flock to the islands, the dearth of workers appears to be one of the few things holding back the economy, Laney said. "I think one of the biggest constraints we have in terms of growth is a shortage of the qualified people we need to fill jobs," he said. Although Laney said the worker shortage could slow growth, it probably would not cause the economy to stop growing or contract. That's in part because workers can migrate to Hawaii to work in the industries that are most desperate for employees, which workers have done in the construction industry. Although high housing costs might diminish the ability of people to come here, Laney said those costs do not eliminate the migration of workers altogether. In any case, Laney said he does not foresee the unemployment rate rising much anytime soon.